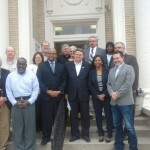 Larry Britt, Tim Liddy, John Faulkner, Christy Owens, Mike Parker, Mayor Kelvin Buck, Wally Lammons, Darlene Grimes, Mike Marshall, Ron Campbell, Belinda Hollowell, Pam Lewis, Sharon Gardner, Bill Stone and Clay Moore. Holly Springs Mayor Kelvin Buck met with area partners to say thanks for assistance in making it possible to repair the Holly Springs lagoon. Delta Regional Authority kicked in $150,000 to top the project out. That money along with $500,000 from the Mississippi Development Authority and Northeast Mississippi Planning and Development District and about $100,000 of city money will mean that the work on the project will take place soon. Holly Springs City Hall Salutes men and women who sacrificed so much for our country. We proudly fly our United States flags. Have a wonderful Memorial Day weekend.